Perhaps our most controversial decision about our Portugal trip was deciding to visit the Lisbon Coast instead of Algarve. Everyone raves about the Algarve, but we just felt like we wanted to keep a little closer to the northern part of the country since we were so short on days. We're so glad we did. 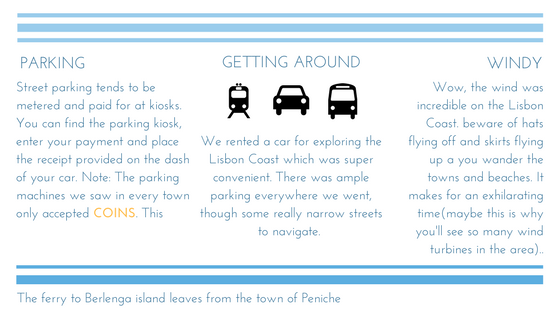 The Lisbon Coast is amazing and we were particularly smitten with the town of Ericeira. We also explored Sintra, though were a little less than smitten here (I know everyone else who has ever visited loves it). Sintra just felt a bit too touristy for us and was super focused on castles and such. Sadly, these aren't much our cup of tea. We also were able to take the ferry out to Berlenga Island, and while the boat ride to the island was quite rough, it was well worth the struggle. The Lisbon Coast is a beautiful part of the country full of small towns with interesting history and should definitely be on your list for exploration.